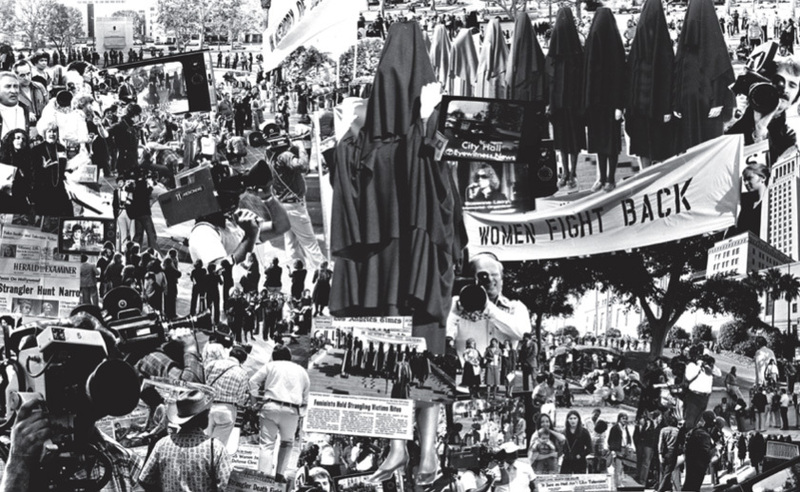 Leslie Labowitz, A Woman's Image of Mass Media (detail), 1979, photomontage, 8 x 24'. The Performing Archive, 2006–, Suzanne Lacy and Leslie Labowitz’s recent project, questions the functions of performance art, historical documentation, and sculpture while testing the limits of all three. “Restricted Access,” the first exhibition of this ongoing endeavor, offers a dialogue between two generations of women artists about these ideas (and their relevance to feminism today). The exhibition is an experimental context for the (mostly paper) archives of Lacy and Labowitz’s women’s activist organization Ariadne: A Social Art Network, which includes personal correspondence, photos, props, T-shirts, publications, and performance scores for actions carried out between 1977 and 1982. In a narrow studio space, a wall of shelves is lined with several white archival storage boxes interspersed with silver video monitors. On screen, twelve participants—all young, Los Angeles–based women artists—select material from the boxes and offer subjective speculations as to the significance and value of the objects. One artist is drawn to the radical chic of a snapshot taken at the Women’s Building in the '70s. To another participant, a back issue of Artforum, dog-eared at an essay by Martha Rosler, reflects a strong community of women who supported each. Included in the show are several of these objects in display cases and an eight-by-twenty-four-foot photomontage of images from Lacy and Labowitz’s 1977 media event, In Mourning and in Rage. While this important archive doubtlessly recounts a rich feminist history, its secrets become “restricted” when constrained by singular editorial readings. Through this performative experiment, Lacy and Labowitz activate their own history in a smart, current way—and thankfully save it from a slip from (or into) institutional memory.